Imogen's Typewriter. 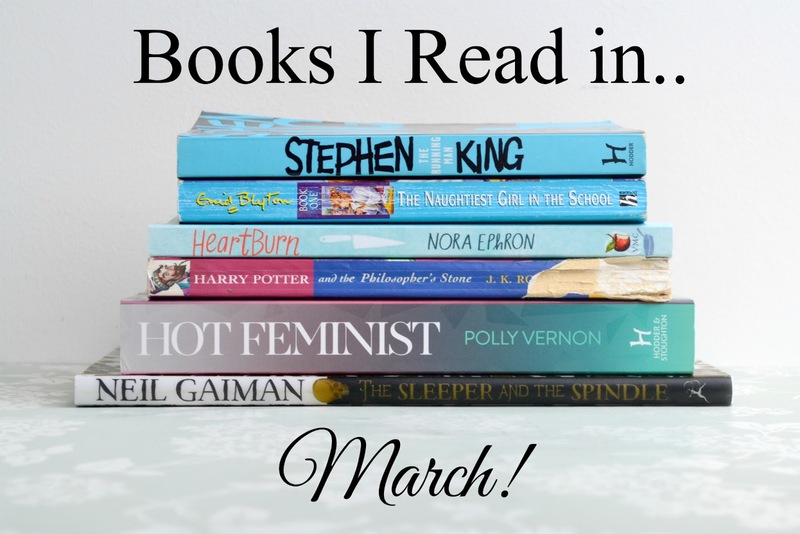 : Books I Read in.. March! When I realised that I was currently reading five books and didn't want to pick up any of them, I went on a hunt through my mountains of books for something new, exciting and quick. I knew I needed something to snap me out of it before I hit a slump and The Running Man was the first one I picked up. The story was great, the world building was interesting and it's a plot line that appeals to me, and probably the majority of YA readers- Murderous Reality TV. Unfortunately, this was written back in 1982 and things that probably wouldn't have got past an editor now, did. Unchallenged racist and homophobic language, the references that after a quick Google led back to blackface, and weird ideas on masculinity and prostitution all make the main character super unlikeable. Consider my interest in King's work timidly rekindled, but I worry about what I'm going to pick up in a re-read of some of my old favourites now that I'm more aware of problematic stuff. It looked like the skeleton of a murdered idea. I suddenly felt the urge near the end of the month to revisit some books from my pre-double-didgets childhood and nobody fills that criteria better than Enid Blyton! The Naughtiest Girl in School was never my favourite but it's the only series I could find #1 of and I really enjoyed re-visiting it. I'm pretty sure these books were the reason I wanted to go to a boarding school and the morals weren't bad. It is a bit dated though and I'm not rushing to find the next book. I love Nora Ephron. She wrote my all-time favourite movie; You've Got Mail and I was really excited when I got her only novel for Christmas. It was good! Ephron has written a 'fictional' book about her marriage that ended when her husband cheated on her when she was pregnant, and it has all the wit of her movies without the romance. There are a couple times when lines from her movies were put in exactly, which I enjoyed as a big fan. She's funny and brutally honest about how it happened and how she felt- even if it's not how you expect her to feel. It's an easy read with a meandering pace and at 180 pages, there's no fat to trim. I really enjoyed it and it probably would have been a perfect book if it wasn't for the weird digs at feminists and lesbians, and the use of some seriously out-dated terms in one chapter. I just wish Nora had an editor that had chopped out that dang chapter as the rest was concise, honest, and the perfect gift for some of my friends. I honestly believed that Mark had learned his lesson. Unfortunately, the lesson he learned wasn't the one I had in mind; what he learned is that he could do anything, and in the end here was a chance I'd take him back. This was my top choice for the Quiet re-read-a-thon but it took me just under a week to get through. I've reviewed this before and talked about reading it with my best friend who never read the books as a kid but this time it felt different. Maybe because I was reading it as a physical book rather than listening to the audiobook, maybe because I know the story so well that it just didn't hold my attention as well, but I only gave it four stars because it felt like it was missing something. ... the shelves were stacked to the ceiling with books as large as paving stones bound in leather; books the size of postage stamps in covers of silk; books full of peculiar symbols and a few books with nothing in them at all. I love love love Chris Riddell's artwork so when my brother got me this for Christmas I was super excited. Chris Riddell doesn't let me down, he never has, and he probably never will. I'm already setting myself up for a re-read of the Edge Chronicles because I need more of his gorgeous art near my eyeballs. I mean- look at it. The story was fun, and I love a story where it's ladies helping ladies, but I felt like without the artwork the story would have been nothing. I mean, it is a kids book but it was super predictable. She was herself, and the name she had been born with had been eaten by time and lack of use. What did you read this month? Have you read any of these books?